Cool Hand Burg: Erik still doesn't like...people. 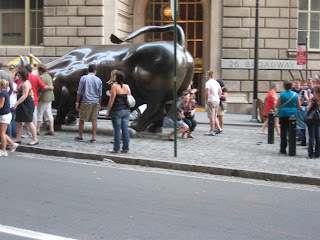 So there's this bull down in the Financial District (it's not on Wall St., Karen can give you the details so ask her if you want the full story*) and tourists think it's really funny to touch his, well, ok . . . let's start here: Erik wanted to take a picture of Mrs. Burg being gored by the bull. That would be funny . . . and tasteful. But, the bull was too crowded by jackasses doing stuff to his, um, stuff. *Courtesy of "Inside the Apple", it's really the gift that keeps on giving, right? Right?